Golfers, as a whole, don't read much about the game they love to play. Reading these thought provoking blogs or the Snooty Golf Magazine's latest and greatest monthly tip does not count. We're talking books here. How can we make this brash statement? Why a survey, of course. It may not be the super-scientific survey that you get from the ABC/ESPN/NY Times that can slant the results to fit their convictions, but it is simple and straightforward. Just ask a couple of simple questions, “What was the last golf book you read? And, When was that?” Just a name and a date. Nothing else. We've been doing this for a while now and can safely support our opening statement. And, as soon as the check from this government-funded study arrives, we will publish the findings. The Art of Putting by Stan Utley. I read a fair quantity of books that claim to fall into the golf instruction category. (Many don't by the way.) This one is an exception, an excellent instruction book and one of the best ever on putting. We all know how important putting is. Just do the math. Before you hit your first tee shot, half of the game is played on the green. Utley's The Art of Putting is simple, practical, and right to the point – the necessary ingredients for a good instruction book. Utley takes you from “The Basics” right through “Advanced Techniques” and “Faults and Fixes.” This book will teach you how to putt from the moment you open the cover. One sad note, there is a DVD that can come with the book, don't bother. It doesn't really cover much of what is in the book. Fairways of Life by Matthew Adams. For inspiration from the game of golf, you can't go wrong with Adams' uplifting insight. You might remember him from Chicken Soup for the Soul of America, The Golf Channel and a few other journalistic adventures. This is Adams' forte. Real life stories and short, uplifting essays make up the majority of the book. It's short, fast reading that will leave you feeling good about yourself and the game of golf. 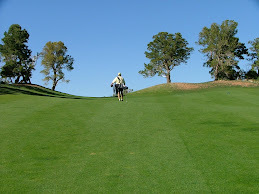 It may also motivate you to do more for the game of golf. A Disorderly Compendium of Golf by Lorne Rubenstein and Jeff Newman. This is the book that follows the statement, “Everything you wanted to know about golf, but were afraid to ask.” It has pages and pages of fun facts about the game and, true to its title, it is organized in a disorderly manner. There is no Chapter One where you might find everything about The Masters and Augusta National. In fact there is no Chapter One, or Two, or Three...and no Table of Contents. It's just a volume stuffed with stuff about golf – fact, figures, stories, anecdotes and a few statistical goodies. You might not agree with everything the authors have to say but it's an entertaining read for any golf fan. 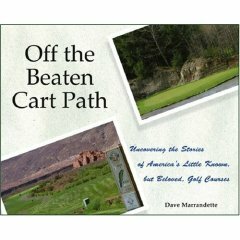 Off the Beaten Cart Path by Dave Marrandette. Yes, this is my latest book. It was written during our travels around the country in a motorhome. You'll find stories and pictures of nineteen distinctive golf courses throughout the country, courses you won't find in Golf Magazine, Golf Digest, etc. Perhaps this volume will motivate you to discover your own hidden gems that may be as close as a few miles up the street. So, there's just four. Now go for it. Fore!